Sliding Bolster Log Trailers - by Kaufman Trailers! 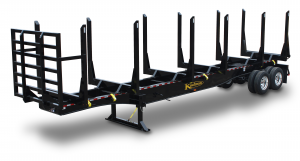 Kaufman Sliding Bolster Log trailers are what the logging industry has been expecting for many years but no other manufacture has been able to deliver. Hauling 3 bunks of randomly sized hardwood has never been so easy with the ability to slide the four center bolsters. The most highly touted feature of our 6 bolster trailer is its stability when fully loaded. The main frame is constructed with two 24” deep, high tensile, fully fabricated main beams and full depth cross-members at approximately 50” on center. By combining the strongest main beams in the industry with the strongest and most tightly spaced crossmembers, we have set a new standard for stability when hauling heavy timber. This trailer comes with a heavy duty, overslung 4-spring Hutchens H-9700 suspension. Watson single point or Ridewell air ride optional suspensions are available for a nominal up charge. Sliding bolsters are also designed so that they can easily be welded into place if needed. We also include our heavy duty square tubing style headache rack for added peace of mind in difficult situations. See our Sliding Bolster Log Trailers ads in The Truck Paper, Southern Loggin’ Times, and Lumbermen Online. Frame (2) - 24" nominal Main-frame full length beams, fabricated with 130 KSI high tensile flanges and 80 KSI high tensile webs.